1 H None No Power Seat 1 H is a standard First Class suite. 1 L None No Power Seat 1 L is a standard First Class suite. 11 J None No Power Seat 11 J is a standard Business Class seat. 13 C None No Power Seat 13 C is a standard Business Class seat whose proximity to the galley may be bothersome. 13 J None No Power Seat 13 J is a standard Business Class seat whose proximity to the galley may be bothersome. 13 L None No Power Seat 13 L is a standard Business Class seat. 14 A None No Power Seat 14 A is a standard Business Class seat whose proximity to the lavatories and galley may be bothersome. 14 C None No Power Seat 14 C is a standard Business Class seat whose proximity to the lavatories and galley may be bothersome. 14 D None No Power Seat 14 D is a standard Business Class seat whose proximity to the lavatories and galley may be bothersome. 14 H None No Power Seat 14 H is a standard Business Class seat whose proximity to the lavatories and galley may be bothersome. 14 J None No Power Seat 14 J is a standard Business Class seat whose proximity to the lavatories and galley may be bothersome. 14 L None No Power Seat 14 L is a standard Business Class seat whose proximity to the lavatories and galley may be bothersome. 15 C None No Power Seat 15 C is a standard Business Class seat. 15 J None No Power Seat 15 J is a standard Business Class seat. 15 L None No Power Seat 15 L is a standard Business Class seat. 2 H None No Power Seat 2 H is a standard First Class suite. 2 L None No Power Seat 2 L is a standard First Class suite. 3 H None No Power Seat 3 H is a standard First Class suite. 3 L None No Power Seat 3 L is a standard First Class suite. 31 A None No Power Seat 31 A is a standard Premium Economy Class seat that has extra legroom, however, the proximity to the lavatories and galleys may be bothersome. The tray table is in the armrest, making the armrest immovable and slightly reducing the seat width. There is no floor storage for this seat during take-off and landing. 31 B None No Power Seat 31 B is a standard Premium Economy Class seat that has extra legroom, however, the proximity to the lavatories and galleys may be bothersome. The tray table is in the armrest, making the armrest immovable and slightly reducing the seat width. There is no floor storage for this seat during take-off and landing. 31 C None No Power Seat 31 C is a standard Premium Economy Class seat that has extra legroom, however, the proximity to the lavatories and galleys may be bothersome. The tray table is in the armrest, making the armrest immovable and slightly reducing the seat width. There is no floor storage for this seat during take-off and landing. 31 D None No Power Seat 31 D is a standard Premium Economy Class seat that has extra legroom, however, the proximity to the lavatories and galleys may be bothersome. The tray table is in the armrest, making the armrest immovable and slightly reducing the seat width. There is no floor storage for this seat during take-off and landing. 31 E None No Power Seat 31 E is a standard Premium Economy Class seat that has extra legroom, however, the proximity to the lavatories and galleys may be bothersome. The tray table is in the armrest, making the armrest immovable and slightly reducing the seat width. There is no floor storage for this seat during take-off and landing. 31 F None No Power Seat 31 F is a standard Premium Economy Class seat that has extra legroom, however, the proximity to the lavatories and galleys may be bothersome. The tray table is in the armrest, making the armrest immovable and slightly reducing the seat width. There is no floor storage for this seat during take-off and landing. 31 H None No Power Seat 31 H is a standard Premium Economy Class seat that has extra legroom, however, the proximity to the lavatories and galleys may be bothersome. The tray table is in the armrest, making the armrest immovable and slightly reducing the seat width. There is no floor storage for this seat during take-off and landing. 31 J None No Power Seat 31 J is a standard Premium Economy Class seat that has extra legroom, however, the proximity to the lavatories and galleys may be bothersome. The tray table is in the armrest, making the armrest immovable and slightly reducing the seat width. There is no floor storage for this seat during take-off and landing. 31 K None No Power Seat 31 K is a standard Premium Economy Class seat that has extra legroom, however, the proximity to the lavatories and galleys may be bothersome. The tray table is in the armrest, making the armrest immovable and slightly reducing the seat width. There is no floor storage for this seat during take-off and landing. 31 L None No Power Seat 31 L is a standard Premium Economy Class seat that has extra legroom, however, the proximity to the lavatories and galleys may be bothersome. The tray table is in the armrest, making the armrest immovable and slightly reducing the seat width. There is no floor storage for this seat during take-off and landing. 32 L None No Power Seat 32 L is a standard Premium Economy Class seat. 33 L None No Power Seat 33 L is a standard Premium Economy Class seat. 34 L None No Power Seat 34 L is a standard Premium Economy Class seat. 35 J None No Power Seat 35 J is a standard Premium Economy Class seat. 35 L None No Power Seat 35 L is a standard Premium Economy Class seat. 36 C None No Power Seat 36 C is a standard Premium Economy Class seat. 36 J None No Power Seat 36 J is a standard Premium Economy Class seat. 36 L None No Power Seat 36 L is a standard Premium Economy Class seat. 37 A None No Power Seat 37 A is a standard Premium Economy Class seat that is missing a window. 37 C None No Power Seat 37 C is a standard Premium Economy Class seat whose proximity to the lavatories may be bothersome. 37 J None No Power Seat 37 J is a standard Premium Economy Class seat whose proximity to the lavatories may be bothersome. 37 L None No Power Seat 37 L is a standard Premium Economy Class seat that is missing a window. 38 A None No Power Seat 38 A is a standard Economy Class seat with extra legroom due to the Exit Row, however, the proximity to the lavatories may be bothersome. 38 B None No Power Seat 38 B is a standard Economy Class seat with extra legroom due to the Exit Row, however, the proximity to the lavatories may be bothersome. 38 C None No Power Seat 38 C is a standard Economy Class seat with extra legroom due to the Exit Row, however, the proximity to the lavatories may be bothersome. 38 J None No Power Seat 38 J is a standard Economy Class seat with extra legroom due to the Exit Row, however, the proximity to the lavatories may be bothersome. 38 K None No Power Seat 38 K is a standard Economy Class seat with extra legroom due to the Exit Row, however, the proximity to the lavatories may be bothersome. 38 L None No Power Seat 38 L is a standard Economy Class seat with extra legroom due to the Exit Row, however, the proximity to the lavatories may be bothersome. 39 D None No Power Seat 39 D is a standard Economy Class seat with extra legroom, however, the proximity to the lavatories may be bothersome. 39 E None No Power Seat 39 E is a standard Economy Class seat with extra legroom, however, the proximity to the lavatories may be bothersome. 39 F None No Power Seat 39 F is a standard Economy Class seat with extra legroom, however, the proximity to the lavatories may be bothersome. 39 H None No Power Seat 39 H is a standard Economy Class seat with extra legroom, however, the proximity to the lavatories may be bothersome. 47 A None No Power Seat 47 A is a standard Economy Class seat with limited recline. The proximity to the galleys may be bothersome. 47 B None No Power Seat 47 B is a standard Economy Class seat with limited recline. The proximity to the galleys may be bothersome. 47 C None No Power Seat 47 C is a standard Economy Class seat with limited recline. The proximity to the galleys may be bothersome. 47 J None No Power Seat 47 J is a standard Economy Class seat with limited recline. The proximity to the galleys may be bothersome. 47 K None No Power Seat 47 K is a standard Economy Class seat with limited recline. The proximity to the galleys may be bothersome. 47 L None No Power Seat 47 L is a standard Economy Class seat with limited recline. The proximity to the galleys may be bothersome. 48 A None No Power Seat 48 A is a standard Economy Class seat with extra legroom due to the Exit Row, however, the proximity to the galleys may be bothersome. 48 B None No Power Seat 48 B is a standard Economy Class seat with extra legroom due to the Exit Row, however, the proximity to the galleys may be bothersome. 48 C None No Power Seat 48 C is a standard Economy Class seat with extra legroom due to the Exit Row, however, the proximity to the galleys may be bothersome. 49 C None No Power Seat 49 C is a standard Economy Class seat whose proximity to the galleys may be bothersome. 49 J None No Power Seat 49 J is a standard Economy Class seat whose proximity to the galleys may be bothersome. 49 K None No Power Seat 49 K is a standard Economy Class seat whose proximity to the galleys may be bothersome. 49 L None No Power Seat 49 L is a standard Economy Class seat whose proximity to the galleys may be bothersome. 50 D None No Power Seat 50 D is a standard Economy Class seat that has extra legroom due to the position of the bulkhead however, the proximity to the galleys may be bothersome. 50 E None No Power Seat 50 E is a standard Economy Class seat that has extra legroom due to the position of the bulkhead however, the proximity to the galleys may be bothersome. 50 F None No Power Seat 50 F is a standard Economy Class seat that has extra legroom due to the position of the bulkhead however, the proximity to the galleys may be bothersome. 50 H None No Power Seat 50 H is a standard Economy Class seat that has extra legroom due to the position of the bulkhead however, the proximity to the galleys may be bothersome. 62 A None No Power Seat 62 A is a standard Economy Class seat in the last row of the aircraft whose proximity to the lavatories may be bothersome. 62 C None No Power Seat 62 C is a standard Economy Class seat in the last row of the aircraft whose proximity to the lavatories may be bothersome. 62 J None No Power Seat 62 J is a standard Economy Class seat in the last row of the aircraft whose proximity to the lavatories may be bothersome. 62 L None No Power Seat 62 L is a standard Economy Class seat in the last row of the aircraft whose proximity to the lavatories may be bothersome. 63 D None No Power Seat 63 D is a standard Economy Class seat whose proximity to the lavatories may be bothersome. 63 H None No Power Seat 63 H is a standard Economy Class seat whose proximity to the lavatories may be bothersome. 64 D None No Power Seat 64 D is a standard Economy Class seat in the last row of the aircraft whose proximity to the lavatories may be bothersome. 64 E None No Power Seat 64 E is a standard Economy Class seat in the last row of the aircraft whose proximity to the lavatories may be bothersome. 64 F None No Power Seat 64 F is a standard Economy Class seat in the last row of the aircraft whose proximity to the lavatories may be bothersome. 64 H None No Power Seat 64 H is a standard Economy Class seat in the last row of the aircraft whose proximity to the lavatories may be bothersome. 80 A None No Power Seat 80 A is a standard Business Class seat. 80 C None No Power Seat 80 C is a standard Business Class seat whose proximity to the lavatory may be bothersome. 80 J None No Power Seat 80 J is a standard Business Class seat whose proximity to the lavatory may be bothersome. 80 L None No Power Seat 80 L is a standard Business Class seat. 81 C None No Power Seat 81 C is a standard Business Class seat. 81 J None No Power Seat 81 J is a standard Business Class seat. 81 L None No Power Seat 81 L is a standard Business Class seat. 82 J None No Power Seat 82 J is a standard Business Class seat. 82 L None No Power Seat 82 L is a standard Business Class seat. 83 J None No Power Seat 83 J is a standard Business Class seat. 83 L None No Power Seat 83 L is a standard Business Class seat. 84 J None No Power Seat 84 J is a standard Business Class seat. 84 L None No Power Seat 84 L is a standard Business Class seat. 85 J None No Power Seat 85 J is a standard Business Class seat. 85 L None No Power Seat 85 L is a standard Business Class seat. 86 C None No Power Seat 86 C is a standard Business Class seat whose proximity to the lavatory may be bothersome. 86 J None No Power Seat 86 J is a standard Business Class seat. 86 L None No Power Seat 86 L is a standard Business Class seat. 87 J None No Power Seat 87 J is a standard Business Class seat whose proximity to the lavatory may be bothersome. 87 L None No Power Seat 87 L is a standard Business Class seat. First and Business class seats have AVOD entertainment systems that offers 12 music channels in both Chinese and English. Economy class offers audio entertainment in both English and Chinese. First and Business class seats have AVOD entertainment systems that offers classic movies in both Chinese and English. First and Business class seats have universal power ports. There is no power in Economy. Air China offers a variety of complementary meals, snacks, and beverages on medium-long-haul flights. Please visit Air China's site for more information. Air China's Boeing 747-8 is a 4-class aircraft that seats a total of 365 passengers. This aircraft features 12 First Class open suites, 54 Business Class flat seats, 66 Premium Economy seats, and 292 standard Economy Class seats. This is definitely a GOOD seat. You can travel with your love without a third traveler around. Also, as the curve of the airplane, this seat has a significantly larger leg room on the left. This seat is clearly colored "red" as it is located to about 30% in the aisle walkway. So all people basically need to walk around you, frequently bumping into your left elbow. Main point here is that this area of the plane is not bothered by the lavatories, in fact they are so quiet you can't even here them! There are IFEs at every seat, and there is AC and USB power at each seat. The AC ports are located below your seat. The seat was awesome and had a little legrest too, which is good since your can rest your legs, but also blocks your legroom. I'd suggest snagging a window seat in this section of the plane as there is a little space for space on the sides and you can access the aisle easily. The arm rest is not liftable. There is a small table in the arm rest, and the usual tray table on the front (as per normal). The windows are not on every 'panel' for this part of the cabin. The side alternates between no-window, and window. Each seat kind of strides 2 'panels'. There is on demand television in every seat in economy class. The seats are B/E Aerospace's Diamond, so it can turn into a flat bed 180 degree. I flew on this plane from New York to Beijing, and the seat was pretty good. In the first 3 rows, of the upper deck business class, you get a lot more privacy, than in the rows 83-87. Food was great, the entertainment screen was responsive for most of the flight (until before landing), and the seat looked pretty new, aside from one compartment, which had not been cleaned in ages! The pilot, was very experienced, and made a very smooth landing, during some quite unpleasant turbulence (Just the last 20 minutes of the flight). I would fly in this seat again. 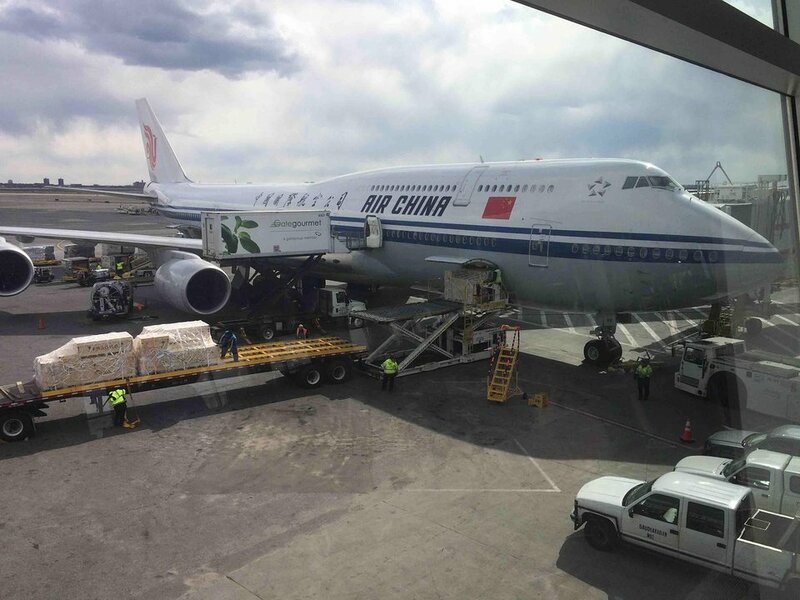 I was on this flight from JFK-PEK and returning, and I was thoroughly pleased with the economy class on Air China's 747-8. The seat was comfortable and easy to fall asleep in (important on a 14 hour trip), and the legroom and seat width were fine. The seat back IFE was really nice and provided a variety of movies and TV shows in English and Chinese, and despite having two massive engines right outside of the window the flight was relatively quiet. Overall I was satisfied with the product and would fly this aircraft with Air China again. Seat 31J and 31C have way more legrooms than other economy and premier economy seats as these two seats face the pathway in front directly. However, for the same reason, other passengers waiting for the lavatory may bump into these two seats. In addition, all seats on this aircraft have AVOD inflight entertainment systems. 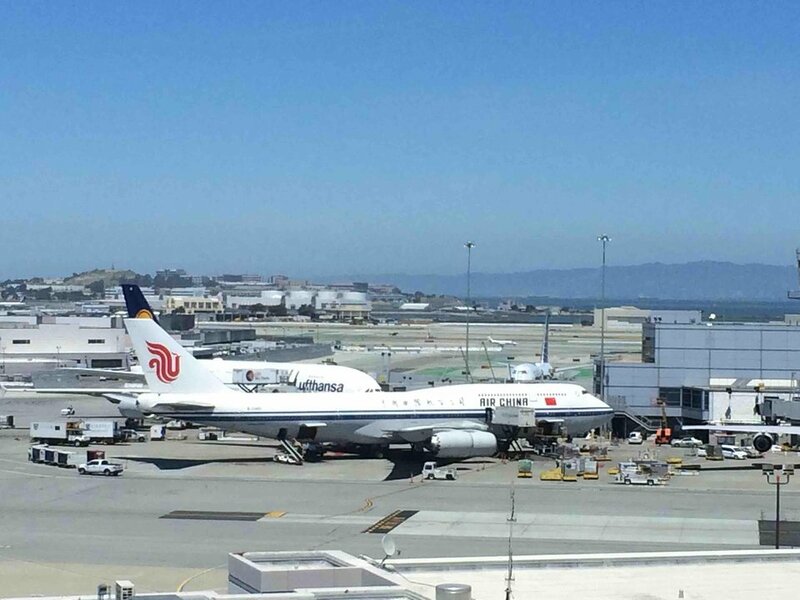 Air China flies 1 versions of Boeing 747-8.